There are million of apps available on Google Play Store. There are lot of Android users like to download and install these apps from Google Play Store. Sometime children’s open and install unwanted app on your Android phone. At this time we need to set parental lock on Google Play Store. Sometime we need to apply restrictions to start downloading any apps and games from Google Play Store due to the children’s. Few apps and games are harmful for you system. If you doesn’t have any antivirus and your children install any games or app virus attack on your system. Due to that you have to lost the security and important data from your phone. In that situation, we need to set any parental lock on Google Play Store. After that your children is not able to download and install any game or app from Google Ply Store. You have to set parental controls for apps and contents in Google Play Store. Step 1: Tap on the Google Play Store on your Android phone. Step 2: Tap on the menu or three dot button on Google Play Store window. Tap on the “Settings” option. Step 3: Tap on the “Parental controls” option in the “Google Play Store Setting” window. Step 4: By default “Parental controls” option is turn off. If you want to apply restriction for apps, games and contents than you have to turn on this option. Step 5: You have to set the pin number to change the settings for parental control and press OK. Now, you have to set the restrictions for the device. You must have to know each type of content has different options. Step 6: After set all the restriction go back to the home screen of your Android phone. Now, after set parental lock on Google Play Store your child is not able to use them. Must Read: What I can do when Google Play Store is not working? 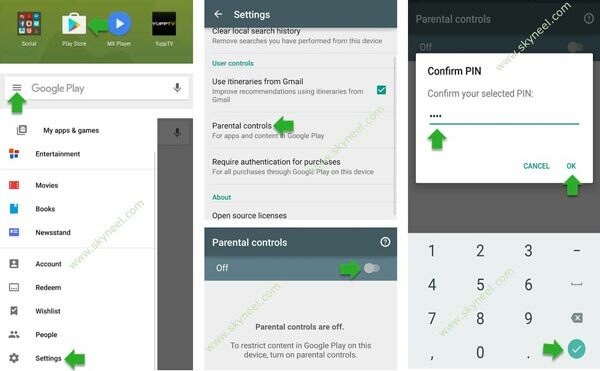 This article is helpful for all those guys who want to set parental lock on Google Play Store. Children don’t know which kind of app or games is trusted or not. If any infection game or virus entered in your system, it will corrupt entire system. So, you have to set parental lock on Google Play Store to keep safe your important data. If you have any suggestion regarding this article please write us in the comment box. Thanks to all.